This summer I’ve teamed up with Bertolli Olive Oil to remix two classic summer recipes. 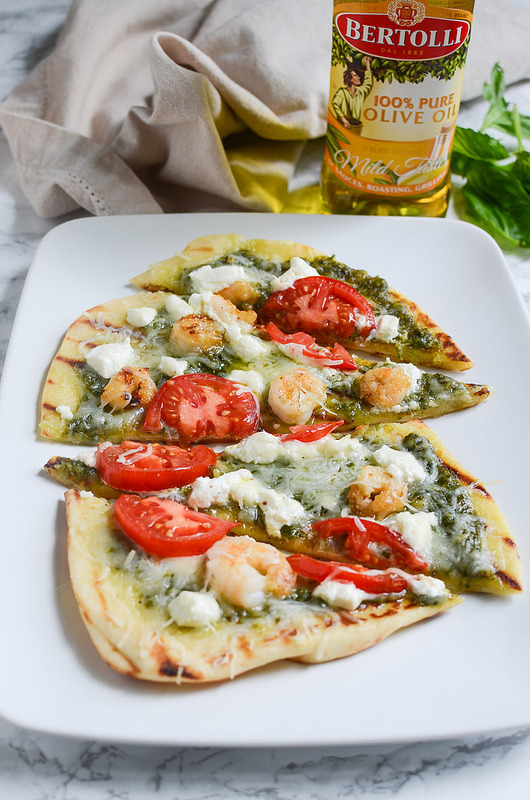 I spun the Bertolli Olive Oil bottle to see what classic summer recipes I got to recreate with my own spin and landed on a pizza and salsa. As excited as I am for fall, I’m pretty sad to say goodbye to grilling and eating dinner outdoors and all that comes along with that. I had an amazing summer filled with delicious food and I’m not sure I’m ready to say goodbye to my grill just yet. Bertolli 100% Pure Olive Oil is perfect for all your grilling needs because it has a high smoke point and a mild flavor. I used it to grill the shrimp and to grill the naan for this pizza. Have you had grilled naan pizza? I love a grilled pizza but I never have luck putting raw pizza dough on the grill so my go-to is naan. It’s fluffy and delicious and the grill plus the Bertolli 100% Pure Olive Oil adds just the right amount of crispiness to the bread. I went with a homemade basil walnut pesto for the sauce. But don’t let the homemade part scare you. It’s as easy as adding all the ingredients to a food processor or blender. And then I topped it with the grilled shrimp, fresh tomatoes (because I can’t get enough this summer! ), mozzarella, and goat cheese. So good. Everything was perfect together. And it’s the ultimate summer dinner. Just sit on the back porch and enjoy your fresh, hot pizza as it comes off the grill. To make the pesto, combine all ingredients in a food processor (or blender) and process until smooth. Refrigerate until ready to use. Skewer the shrimp and brush with 1 tablespoon Bertolli 100% Pure Olive Oil. Season with salt and pepper. Grill over medium-high heat until lightly charred, about 5 minutes. Brush the grill with half of the remaining tablespoon of Bertolli 100% Pure Olive Oil. Brush both side of the naan with the remaining olive oil. Grill for about 5 minutes on one side, until it's crisp. 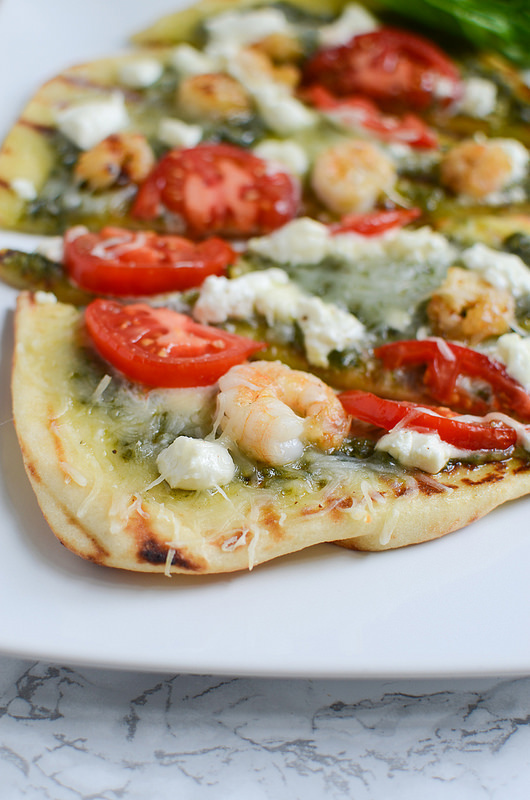 Flip the naan and layer about 2 tablespoons of the pesto, tomato slices, shrimp, and cheeses on the grilled side. Season with salt and pepper. Grill for 5 minutes until cheese is melted and other side of naan is crispy. 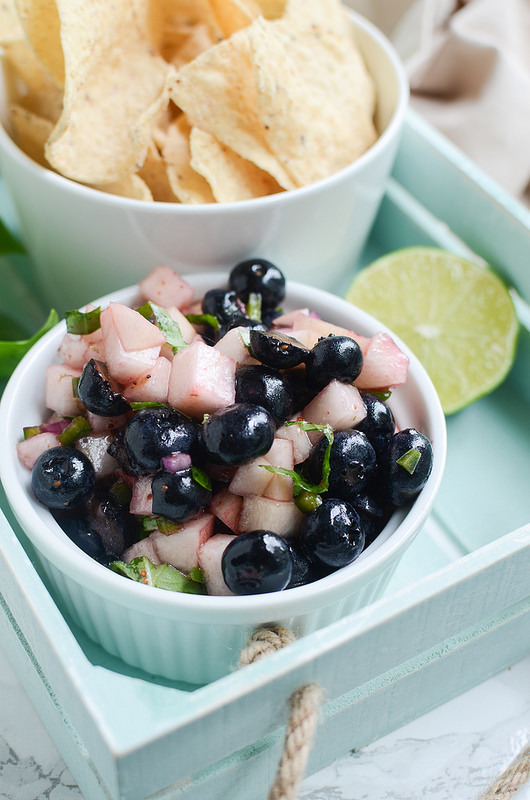 To go with your pizza (because what’s a backyard party without an appetizer), you need to make this Peach and Blueberry Salsa. I know, it sounds weird. Trust me. Have you tried the peaches lately? So sweet, so delicious. And they are extra amazing with the spicy kick of a jalapeno. I threw in some blueberries because those are also really amazing right now. Plus some fresh basil and a splash of Bertolli EVOO and you are good to go. The Bertolli EVOO has a bold, rich taste that is perfect for cold dishes like this salsa. It’s cold pressed so it’s retains a lot of the flavor so it’s best used in recipes where you can really appreciate it. Serve this delicious salsa with tortilla chips like I did for the perfect pre-dinner snack or put it on top of grilled chicken or fish. It’s seriously amazing. 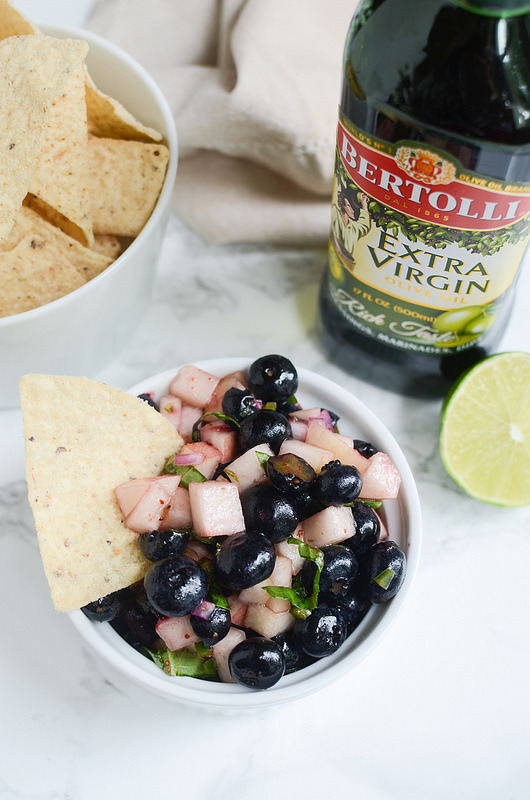 For more recipes featuring Bertolli olive oil, visit their site or follow them on Facebook or Pinterest! Chop half the blueberries. Transfer to a bowl. Add remaining ingredients to bowl and toss gently to combine. Store in refrigerator until ready to serve. 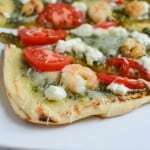 5 Responses to "Grilled Shrimp and Goat Cheese Naan Pizza"
This looks so fresh and inviting, love the sound of that tangy goat cheese! I love all the amazing flavors in this pizza!! YUM! Shrimp and goat cheese together sounds amazing! I haven’t tried that…I also love naan pizzas. I need to try this! Goat cheese on pizza ROCKS! This looks crazy good! Such a great ideas. Love the flavor combo!